Each of our customers has a story, whether it’s that of an engagement, a birth, an anniversary or a promotion. And all along the way, Borsheims is here to provide the perfect gift to seal the deal or celebrate. Our silver box and burgundy box represent more than just what is inside, but a milestone in life that deserves special attention. As we approach 150 years in business, we wanted to explore more of those moments and stories, the threads that connect so many people to our store and the Borsheims family. To spotlight our customer’s unique stories, we are interviewing couples and guests across all of our departments to learn more about why they chose Borsheims. 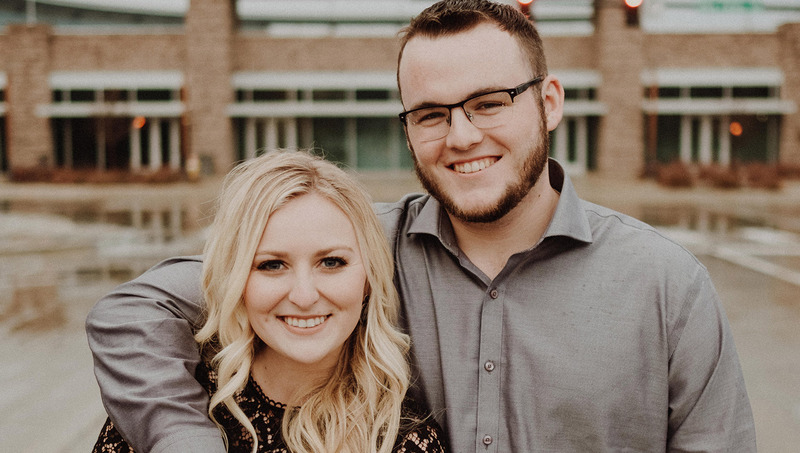 To start, we talked to one of our recent Borsheims Brides, Bailey Nihsen to learn more about her and fiancé Dakota Postlewait’s love story and their experience getting engaged. Tell us a little about you and your partner. What is your love story? Bailey – Dakota and I connected on Tinder in May of 2015. Crazy! We met for the first time in person on the night of my high school graduation. Our relationship really started to grown when we found out that we had a mutual love for baseball. Baseball has always been a huge part of my life in, in fact, you could say I practically grew up at the College World Series. My first CWS was when I was 5 weeks old and I haven’t missed a series since. So, when I found out that Dakota played ball himself, I knew I had hit a home run! We attended our first CWS together that year where he asked me to officially be his girlfriend. Unfortunately, summer came to an end and I left for school at the University of Alabama #rolltide. The next six months of our relationship were spent on Facetime. I transferred home that following year and our relationship was stronger than ever. We traveled a lot and spent several nights underneath stadium lights. December of 2016 rolled around and my entire family took a trip to Hawaii. My grandma said that trip would either make or break our relationship. Dakota and my dad bonded during the Hawaii trip and I knew that this was the man I was going to marry. I love knowing that my relationship is as strong as my parent’s relationship. I have always looked up to them for guidance and direction because my dad is the most romantic person I’ve met and taught me that I should expect nothing less than to be treated like a princess. When Dakota proposed, it was the most incredible moment of my life. It was romantic in every way and it made me feel like that princess my dad said I should always feel like. He proposed at the Joslyn Art Museum and we are getting married there in June of 2019. We’ve shared an incredible life so far, and I am looking forward to many more nights under the stadium lights. Tell us more about your engagement. I started to cry the happiest tears of my life, and of course, said YES!! In my fancy ballgown and my new three stone oval halo engagement ring, I felt like a princess. It was truly a fairytale and I was completely blown away. The ring is absolutely gorgeous, but my favorite part of the ring, you can’t see from the photos. On the inside of the ring, the part that touches the bottom of my finger, are two stones. Our birthstones, emerald and peridot. It’s such a simple yet romantic piece of my ring. What made you decide to get your ring from Borsheims? 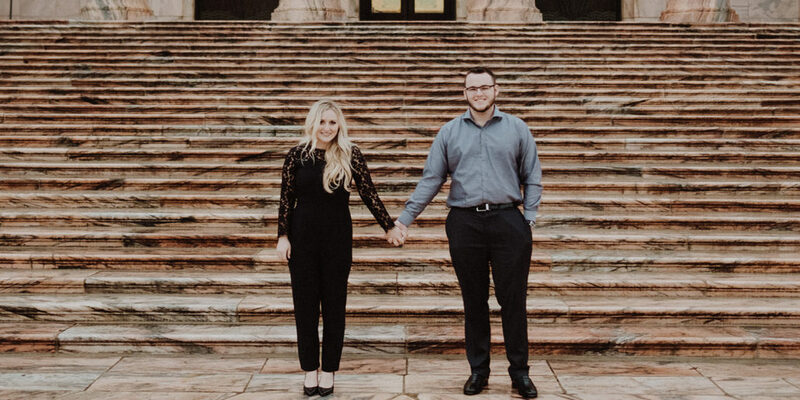 Dakota – I picked Borsheims because I wanted the most perfect ring for Bailey. I went there before the whole process to decide if it was the place I for sure wanted to get her ring from. I went to a couple other places to look, but I found a ring that I knew was Bailey’s at Borsheims and it kept bringing me back. I hadn’t seen anything like the ring I found there, and I knew I wouldn’t be able to make the ring as perfect for Bailey anywhere else but Borsheims. The ring I picked out originally had round stones but because I went to Borsheims, they made it easy for me to customize the ring how I envisioned it. Borsheims is well known and I’ve heard all good things about people’s experiences with them. I wanted to make sure that where I got the ring was somewhere I trust and somewhere I was comfortable with. Overall, how was your Borsheims experience? Did you bring others along, or shop solo? Dakota – My experience at Borsheims was excellent. Holly Lewis helped me out, and she was amazing. Holly helped me understand what color, cut and clarity were and walked me through the entire process of picking out the perfect ring for Bailey. I knew nothing about rings before I went to Borsheims and I felt way more confident picking out the ring after Holly walked me through step by step. I would 100% recommend her to anyone who inquires about where to get a ring and who to go to. I brought along my soon to be father in law. He is very knowledgeable about jewelry and made the process go a lot smoother. I also wanted to make sure that the ring I picked out for Bailey was special and perfect and by having him along it cemented to me this was the ring she deserves. 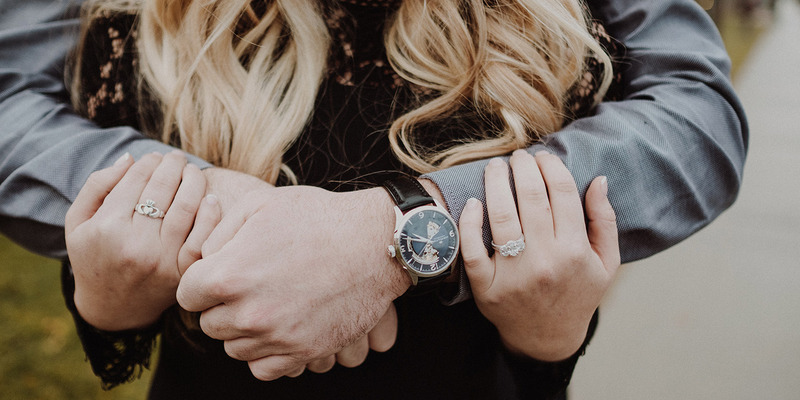 Do you plan to get your wedding bands from Borsheims? Bailey – Yes, we will be purchasing our bands from Borsheims. Dakota had such a wonderful experience with Holly that we will continue to go back and shop with her. My engagement ring was customized, so she knows the ring very well and can help us find the perfect wedding band to match. Do you plan to register at Borsheims? Bailey – Already have! It was so easy and everyone was so friendly and helpful. We were taken step by step through the process of picking out everyday plates to fine china we could use for special occasions. Bailey – This was not our first Borsheims purchase, we shop at Borsheims often, and will continue to be excellent customers. What is your favorite Borsheims Signature Service benefit (free ring cleaning, appraisal, financing, etc.)? Bailey – I have not had anything else done but having my ring resized and my ring cleaned. Dakota had the other things done, but I am not allowed to know the numbers! Ha! 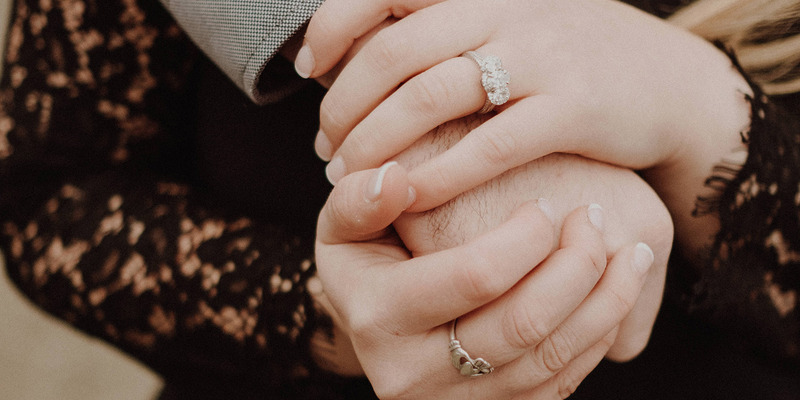 The ring resizing was super easy, everyone knows what they are doing and they helped me decide on the perfect ring size, especially when we decide on the band to add to the engagement ring. My favorite service is the ring cleaning thought because my beautiful ring gets even more beautiful! Would you recommend Borsheims to other couples? Bailey – Absolutely! As Dakota said earlier, we both recommend Holly Lewis and the rest of the team at Borsheims for engagement and wedding band shopping. Outside the ring area of Borsheims also gets our recommendation. Everyone is well versed in all of the products and know a lot about each item. I will always recommend Borsheims to anyone looking for fine jewelry and gifts.